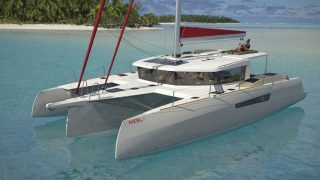 NEEL Trimarans designs and builds world-class cruising trimarans. Founded and managed by Eric Bruneel, NEEL Trimarans is based in France’s sailing capital, La Rochelle. NEEL Trimarans surrounds itself with the best equipment and service suppliers for the construction of its trimarans. 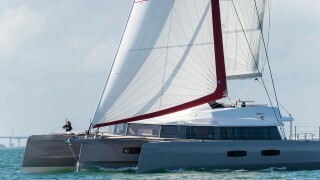 Eric Bruneel has more than 30 years of experience in the design and construction of multihulls, of which 26 (1983-2009) were devoted to the development of Fountaine Pajot catamarans, the world leader of cruising catamarans, whose 2000th unit was delivered in August 2009 and is listed on Alternex Paris New York Stock Exchange in June 2007. Eric was the Export and General Manager of the company where he took an active part in each catamaran’s design and construction. In 2003, he designed and built the fifty-foot trimaran Trilogic aboard which he won his class in the OSTAR 2004 solo transatlantic race as well as the 2005 Rolex Fastnet Race. He also placed second in the 2006 Route du Rhum. It is the combination of these experiences in the world of yachting and racing that led to Eric’s original concept of creating the ultimate fast and comfortable cruising trimaran. 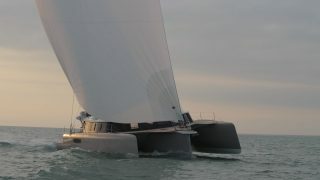 To optimise structural integrity, NEEL trimarans collaborated with TENSYL with whom they have previously worked on the structure of the racing trimaran Trilogic. 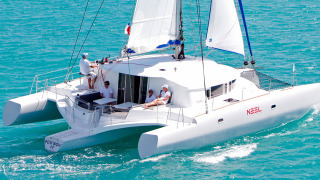 TENSYL specialises in the structural design of multihull racing and cruising composites. Sampling is determined from the most critical cases of offshore loading on the structure, for example, catching a wave at high speed or sailing with the wind on the beam. NEEL trimarans are manufactured with materials and techniques best suited to their use, combining strength, rigidity and weight reduction. Hull, floats, bridges and roof are made in vacuum bonded PVC/foam and glass fibre/ isophthalic polyester resin sandwich structural material. The boards are fabricated from honeycomb PVC, vacuum bonded with glass fibre/isophthalic polyester resin structural material. Fibreglass is stratified according to a sampling plan determined by finite element structural analysis gained from experience in the construction of racing craft and offshore cruising. Depending on their role in the structure of the trimaran, the type and number of glass fibres are either unidirectional, bidirectional, 0 ° / 90 ° or bi-directional 45 ° / 45 °, TAFTA, roving or twill. Phonic and thermal insulation, along with floatation (unsinkability) are provided by the interior of PVC foam sandwich laminates. This closed-cell foam is perfect for the marine environment being virtually insensitive to moisture. Rigging and sails are designed and produced by multihull specialists in La Rochelle. Interior coverings (linings, floor, upholstery) have all been rigorously tested in oceanic conditions before being selected for each NEEL trimaran.